I feel very blessed to have been named an honorable gnome for this past Lawnscaping Challenge (No. 49). I was among a group of very talented stampers and you sure don't want to miss their entries. Thank you to everyone who has commented on my card, it surely does brighten my day! Now onto a bit of a companion card to the hybrid birthday card I shared with you Friday HERE. 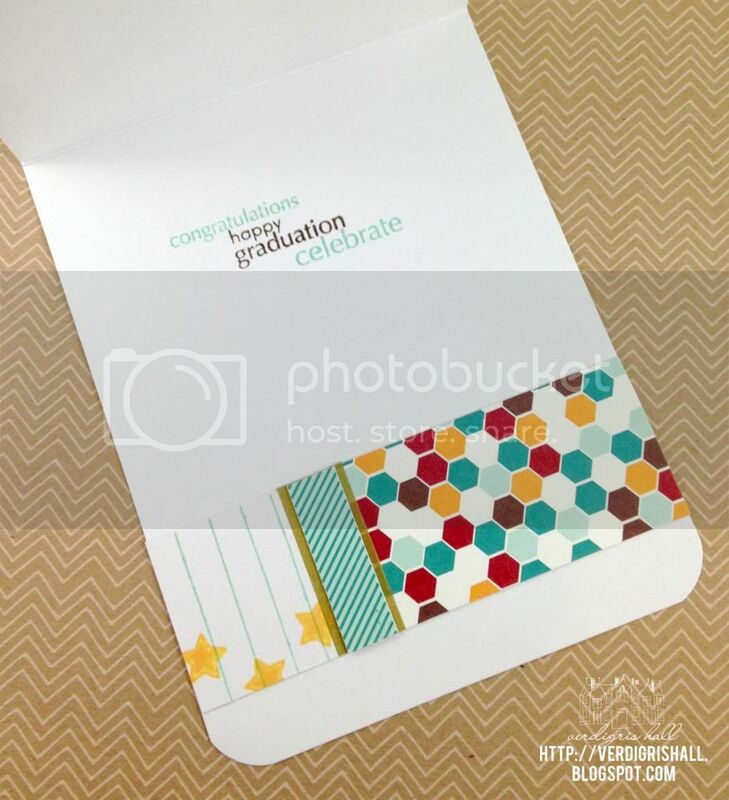 I mentioned that I had Lawn Fawn's Dewey Decimal Petite Paper Pad out for a graduation card I made and this is that card. The lad graduated from a college with the school colors of maroon and gold. I found that one of the patterns in Dewey Decimal had a golden yellow and a maroon-like color in addition to aqua, teal, bright white and chocolate brown. Perfect! I also love the library/school theme to the Dewey Decimal which completely supports graduation and all the papers are from that paper pad. 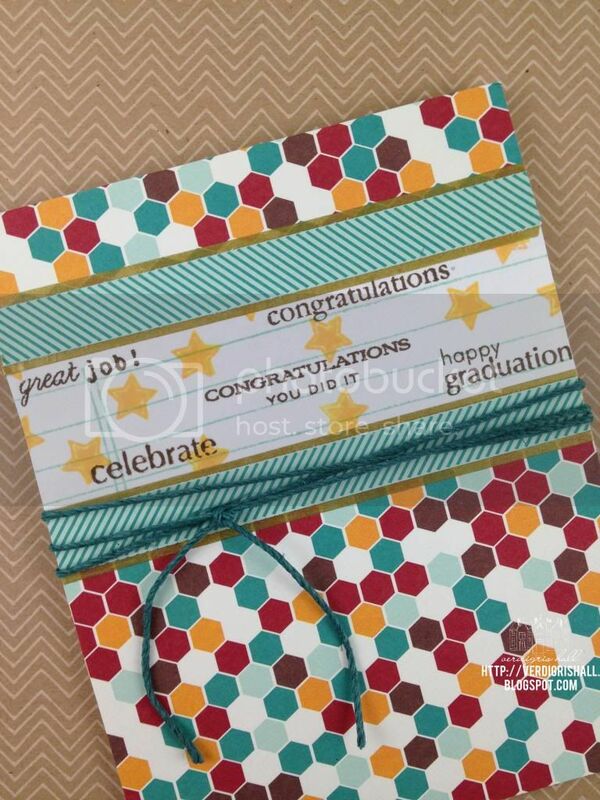 I also pulled out several stamp sets from Papertrey Ink (mostly from the Tag-Its series which have great basic seasonal sentiments) to get some proper congratulatory sentiments. I also tried out my Hero Arts Mid-Tone Shadow Ink in cup o'joe and butter bar...great coverage and color. Some finishing touches were gold washi to add a touch of the gold from the school colors (I added a strip of aqua and teal patterned paper over it because I didn't want *too* much gold) and a little teal lawn trimmings by Lawn Fawn which is a great accent for any gender. 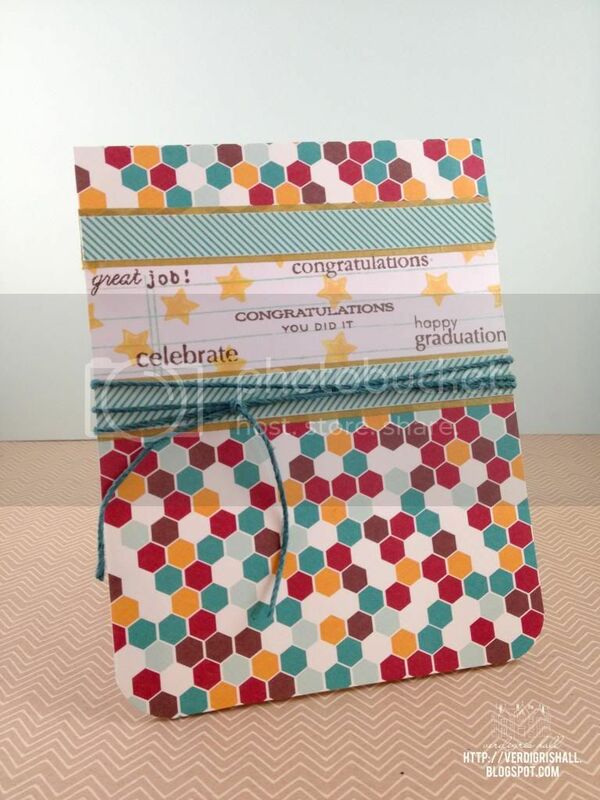 Here is a more detailed shot of all the stamping and you can really appreciate the colors in that hexagon tile patterned paper (love!). That's a wrap on this card. Thanks for stopping by to visit! I love everything about this card. This paper is so vibrant and I like how you added the stars and multiple sentiments to the front. You have inspired me to take more care and attention to the inside of my cards - it is such a nice addition. Well done!